Wigilia means vigil and in Poland this word is used for the meal that is eaten on the evening(vigil) before Christmas Day – so that is the evening meal on Christmas Eve. In Poland Christmas is celebrated from Wigilia and parties and visiting relatives and family happens from then on. It seems very strange to the Poles to have all the Christmas parties before Christmas which is still Advent. This Christmas Eve meal is very important to people and most will try to go to family to share this meal. It is a meal that has many traditions, many more than Christmas Day itself. It is a meal which is filled with memories, many from childhood, and you will find that every family has developed its own traditions. Many years ago when I spoke with my cousins in Poland – my mother’s family – I discovered that the meal they had at Wigilia though based on the same principles was very different that the one we had at home. Advent is the time leading up to Christmas is observed from the 4th Sunday before Christmas (this will be from the 27th November to the 3 December) so that there will be 4 Sundays in Advent. It is a time of reflection, prayer and preparation. 24th December is the last day of Advent and used to be a day of Fasting & Abstinence. there was only 1 main/large meal (fasting). Many people, myself included, keep to this custom. The Christmas days are called Gody – days of Harmony and Goodwill. The official end of the Christmas celebrations in church is the 2nd of February the feast of Candlemas or The Presentation of Christ in The Temple when karniwal – carnival starts in the lead up to Lent. Some people have 3 soups, 3 fish dishes, 3 vegetable dishes and 3 cakes or dried fruit dishes. The meal starts after the first star is seen in the sky as a reminder of the Star of Bethlehem used by the 3 Kings to find the Infant Jesus. (This is much later than the usual main meal of the day in Poland). The food should be from: the fields, the orchard, the garden, the forest and from water. I try to use only foods that would be found in winter in Poland such as seasonal vegetables & preserved foods which have been dried, bottled, fermented, smoked etc. You should try to taste every dish to ensure that there will be nothing lacking in the house & harvest in the coming year. The main dish is the fish – and in olden times some people had up to 12 fish dishes and counted these as ONE! The table should be covered with a white table cloth over straw or hay to remind us of the manger. (People in towns often have a token bunch of hay). Sheaves of wheat are placed in the 4 corners of the room. At the start of the meal is the sharing of opłatek which was originally bread but now is a wafer (like the communion host) and is a symbol of forgiveness, unity and love. Each person has a piece and shares it with everyone else offering each other best wishes for the coming year. People often send a piece of opłatek to family and friends who live far away. Some of these recipes I have already covered & the links have been inserted – others will be appearing throughout the coming year. Stewed dried fruit apples, pears and prunes. The Christmas tree tradition came from Germany in the late 18th Century and early 19th Century into the towns and into richer villages in the 1920s and took over from an earlier Polish Tradition of hanging from the ceiling just the tip of a spruce/fir tree (tip side down) decorated with apples, nuts which were either wrapped in silver or gold paper or painted and ribbons. Old Polish village houses are made of wood so it is easy to attach the tree tip to the ceiling. People in small apartments and in towns or with limited funds often still just decorate a branch of a fir tree. This custom originated in pre-Christian times and texts dating back to the 15th and 16th centuries referred to this use of the tree as a pagan rite. Unable to halt the growing trend, the church then reinterpreted the tree to be the Tree of Knowledge – the tree of good and evil. The tree is put up on Christmas Eve (or maybe a day or 2 before) – the whole family helps – though the candles or lights are not usually lit until Wigilia. Apples symbolise health and beauty. Nuts wrapped in Silver or Gold guarantee prosperity and vitality. When I was young we tied wrapped sweets and chocolates on the tree. Bombki – Glass baubles – in the past these were often blown eggs decorated with glitter. There are also many straw decorations – angels or stars. Glass baubles originated in Germany in the 19th century but they were soon being made in Poland with their large glass blowing industry. Many are made in small family run workshops, some making around 150,000 per day! Some now specialise in individual and unusual designs. Candles in clip on holders with real candles – though now more likely to be artificial lights. The star on the top of the tree helps guide back home absent family and friends. It used to be that presents were given on December 6th, St Nicholas Day and Christmas Eve was more about the meal and carols and Church. Nowadays likely to get presents on both days. 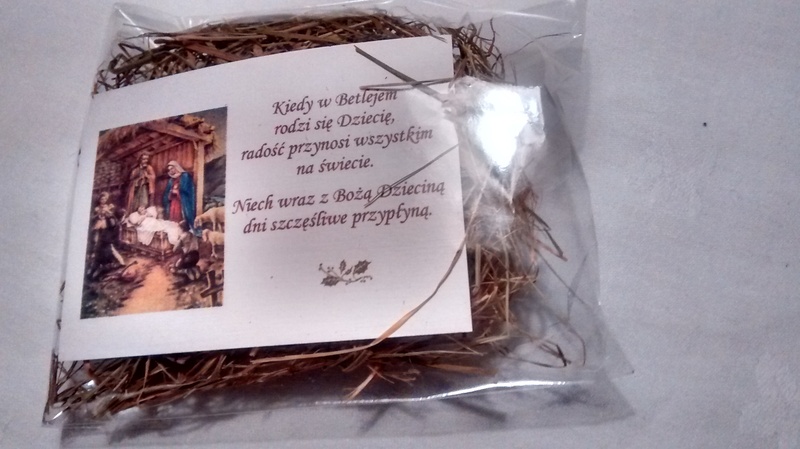 In some parts of Poland these gifts are said to be from aniołek – little angel. Before the Second World War the presents were small tokens such as mandarin oranges (a luxury – as they were imported), chocolate, and an item of new clothes or a small toy. After the meal people go to Mass in memory of the long wait for the Messiah and the Shepherds coming to pay homage to the Infant Jesus. Kolędy – Carols are sung from midnight mass till the 2nd of February in Church. Carols are rich and varied with examples from many different centuries with ones originating from church music, to many with music from the Royal Court such as the Polonaise and to folk & dance music. The oldest carol in the Polish Language is Bogurodzica (Mother of God) and has been known from the beginning of the 13th Century. Very interesting to read, well done! Hi it’s Brenda. Sue’s mother in law. Just about to read your blog have signed up. What’s up,I log on to your new stuff named “Wigilia – Polish Christmas Eve – Journey From A Polish Kitchen” regularly.Your humoristic style is awesome, keep it up! And you can look our website about free ip proxy.